This bonus offer surprised me a little but hey its a bonus and its good for those who have the card. What is it? Its this Kaligo Hotels booking bonus for those of you who hold the RBC British Airways Visa Infinite card. There aren't many of you, we know that but whatever. If you have the card and need to book a hotel for the next year and a half be sure to check out this Kaligo offer. Kaligo is one of those third party hotel booking sites that offers miles for booking through them. You'll want to shop around to double check pricing but it really offers a decent way to earn miles or point on hotels that aren't part of a major chain program or is from one of those majors you don't frequent enough to worry about the benefits and earning from booking direct with that chain. With this 25% bonus you can see up to 20 Avios per C$1.60 spend with Kaligo, that's pretty good but the 20 Avios will come on the higher priced hotels, lower priced hotels will see a lower earn. You have until January of next year to book for stays until July of 2018! 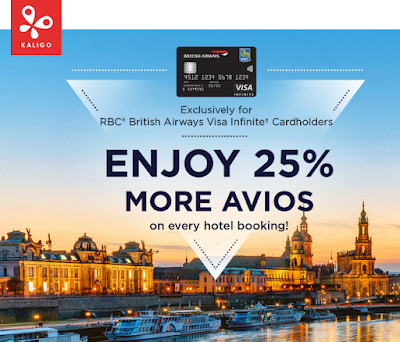 25% Bonus Avios on all hotel stays booked via Kaligo. Full details and online booking Book by Jan 31, 18 for stays until Jul 31, 18 For Canadian RBC British Airways Visa Infinite cardholders only. Find many more BAEC Bonus offers here, like Triple Avios on all British Airways flights!